The Heritage Quilt Show occurs in the main (top) floor of Julian Town Hall, located at the corner of Highway 78/79 and Main Street. The quilt show is open to the public and free of charge. The show is open from 10:00 am to 4:00 pm, beginning June 23 and ending on July 4, 2019. Saturday, June 22 is the Eleanor Burns Quilt Show, and the quilt show will not be open to the public on that day. Each year the Julian Woman’s Club presents its Heritage Quilt Show to display our town’s heritage of quilt making for the enjoyment of quilters and other visitors to Julian. This has been one of our club’s signature events for 28 years. Many visitors, young and old, female and male, local and from around the world, attend the show each year. A “Country Store” within the show offers quilts and boutique items for sale, all hand-made and donated by women in the club. Profits from the sale of these items go toward local scholarships. Unlike “juried” quilt shows, our show is an opportunity for local quilters to exhibit their newly made and heirloom quilts. A “viewers’ choice” balloting is held and the winner receives a ribbon and bragging rights for the year. The Heritage Quilt Show continues to be a success for the club and an important event in our community. The last day of the Heritage Quilt Show coincides with the town’s Independence Day celebration and parade. At 3:00 pm we pick the winning ticket for an “Opportunity Quilt” made by club members and designed by Eleanor Burns. 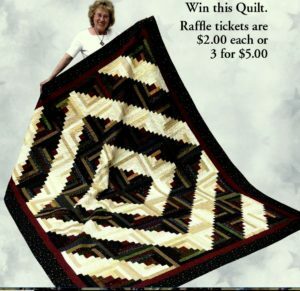 Raffle tickets are available in May at the Wildflower Show and throughout the Quilt Show.